In this lesson, we will learn how to apply the reflection of a point or a polygon across a line in the first quadrant and across an axis of symmetry in a symmetric polygon. Find the reflection of the point 𝐴 in the line 𝐿 . Which of the following does not show a reflection? List the images of the vertices of the triangle shown, after reflection in the dashed line. List the images of the vertices of the quadrilateral shown, after reflection in the dashed line. What is the image of △ 𝐹 𝐷 𝐿 under reflection in ⃖     ⃗ 𝐸 𝐹 ? What is the image of 𝐴 𝐶 under reflection in line ⃖     ⃗ 𝐴 𝐸 ? In which line must 𝐶 𝐴 be reflected to get 𝐵 𝐴 ? In the figure shown, △ 𝐴 𝐷 𝐸 is the image of △ 𝐴 𝐹 𝐸 after reflection in which line? Maged is drawing a reflection of a figure. A vertex of the original figure is at ( 6 , 5 ) , and the reflection of that vertex is at ( 1 6 , 5 ) . What is the distance between each vertex and the line of symmetry? Across which line has △ 𝐵 𝐷 𝐹 been reflected to get △ 𝐶 𝐷 𝐹 ? Across which line has △ 𝐵 𝐸 𝐹 been reflected to get △ 𝐵 𝐷 𝐹 ? Which triangle is the image of △ 𝐴 𝐶 𝐷 after a reflection in ⃖     ⃗ 𝐵 𝐷 ? In which line must △ 𝐹 𝐷 𝐿 be reflected to map it onto △ 𝐹 𝐶 𝐿 ? What are the images of points 𝐴 and 𝐶 after a reflection in 𝐿 ? 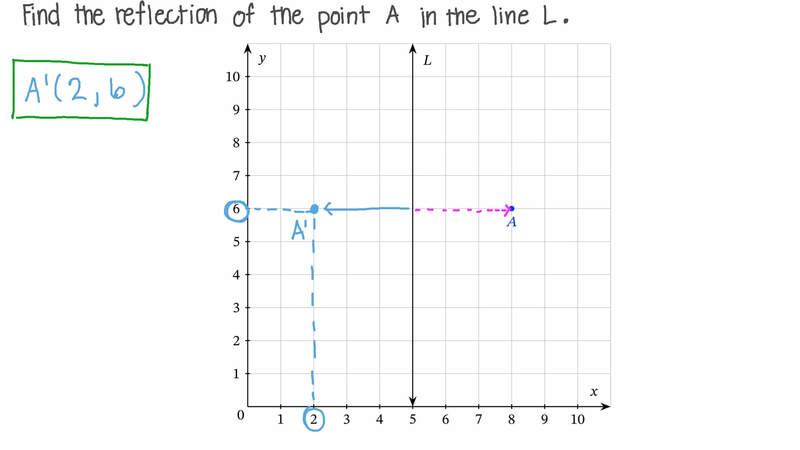 What is the image of the points 𝐴 and 𝐶 after a reflection in the line 𝐿 ? What is the image of 𝐴 ( 9 , − 1 0 ) after reflection in the origin, followed by a reflection in the 𝑥 -axis? What is the image of △ 𝐵 𝐸 𝐿 under reflection in ⃖      ⃗ 𝐺 𝐻 ? What is the image of 𝑀 𝐴 under reflection in line ⃖     ⃗ 𝐵 𝐹 ? In which line must 𝐸 𝐵 be reflected to get 𝐸 𝐶 ?